The struggles that faced talented outfield prospect Mickey Moniak seem to be a thing of the past. Taken with the first overall draft pick by the Phillies in 2016, the expectations have always been high for the talented prospect, but the organization and the player himself are more confident than ever that Moniak's future is bright. 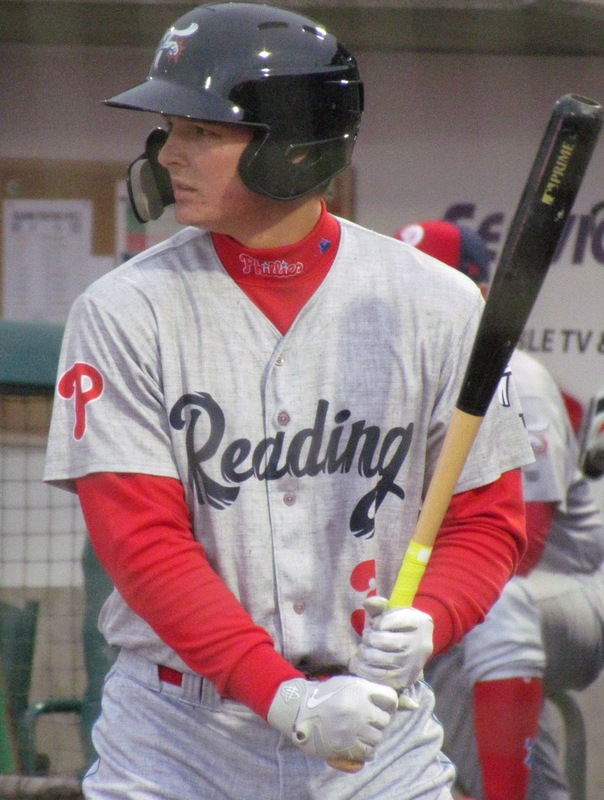 Moniak has known since the start of spring training that he would open the 2019 campaign in the Double-A Eastern League with Reading when their season starts on Thursday night. A meeting with Phils general manager Matt Klentak, team manager Gabe Kapler, director of player development Josh Bonifay and outfield coordinator Andy Abad was the setting where the 20-year-old learned that the Phillies feel he has nothing left to prove in Class A Advanced. Last year with Clearwater, Moniak struggled out of the gate, batting .213 in 22 April games, but he bounced back the rest of the way, batting .285 through the remainder of the campaign. Over the long haul of the season, the lefty hitter sported a .270 average with 28 doubles, three triples, five home runs and 55 RBI in 114 games. "There was really no panic going, just knowing how fast a season can go down or go up," Moniak said. "So, I kind of just trusted myself. And there was a point where I stopped listening to outside sources, articles stuff like that and the negative stuff and just looked forward to playing baseball everyday and just took my time and had some fun again." Moniak's manager with Reading, Shawn Williams, also managed him last season with the Threshers, so he got to see the adjustments and the improved results from Moniak up close. "His at bats got way better, which in turn showed in his results," Williams shared. "He was huge for us down the stretch. He drove in a bunch of big runs. He's really matured and grown up and he's just going to get better the more he plays." The development that Moniak showed after turning a corner in 2018 had him seeing more pitches, improving his strike out to walk ratio by a considerable amount and notching a .333 batting average over his final 32 games with Clearwater. Additionally, Moniak has added muscle to his six-foot-two frame, weighing in at over 200 pounds these days, which is approximately 30 pounds heavier than when he signed as a pro. Moniak will be part of a Fightin Phils starting outfield that includes two other Phillies first round draft picks. The trio, which includes Adam Haseley (2017) and Cornelius Randolph (2015), have bonded during their time in the organization. With something so rare as three top draft picks making up the full outfield on the same team (Williams doesn't think it has happened before) drawing some attention, each of the three are focused on the entire team, getting wins and competing in the EL. Reading opens its season on the road in Portland then heads to New Hampshire for a three-game set before the team begins the home schedule against Richmond on Friday, April 12th. Moniak is already excited to see how his offensive efforts fare at Baseballtown's FirstEnergy Stadium. "Going through the Phillies system, you always hear about Reading and how hitter friendly it is. Going in there you can't really change your game though. You've got to just play your game," Moniak asserted. "I've talked to people whose advice is, 'If you try to hit home runs, you're not going to hit home runs.' So, I'm just looking to go in there and play my game and carry over what I did last season." He's already translated his success last year into a solid spring, Williams said. During the Grapefruit League season, Moniak went 4-for-20 (.200 avg) in 11 exhibition games before joining his teammates in minor league camp. According to Moniak, he was welcomed into the Phillies' locker room and had a high comfort level from the start. Part of that was thanks to another first overall draft pick that signed with the Phils during spring. Star right fielder Bryce Harper took Moniak under his wing once he joined the team. "I talked to Bryce a lot and he pulled me aside and went out of his way to talk to me, which shows what kind of person he is," Moniak stated. "He really cares about the team and the whole organization as a whole. He's really focused on winning and trying to back guys up and have guys' backs. "The main thing he stressed to me was he wants me to be comfortable. He wants all the young guys to be comfortable in the club house and that the whole team's got our backs and, you know, just for us to go out and play the best that we can day in and day out." Moniak feels the time spent around the big leaguers this spring will benefit his future, as he was able to see first-hand what it takes to compete at the top level of the sport. The organization is more certain than ever that his impact will be felt in the majors. "His ceiling," Williams said, "There's no ceiling, 'cause he gets so much better every year."